This book provides a comprehensive and cogent astrological methodology to end meaningful support to the speculators and investors in stock markets for taking timely and prudent decisions to accentuate gains and to avert losses. It intends to cover the fundamental and potent astro-combinations allied to money matters. For those who dabble in stock and bullion markets, the efficacy of Sarvatobhadra Chakra an ancient tool, has been aptly demonstrated. 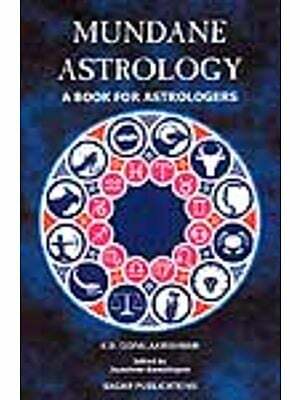 Besides, the book deals with the entire range of business astrology and presents a compact reading in a lucid form. Having been encouraged with fervent response of the esteemed readers, the third edition is revised and enlarged. For their benefit, a trail of stock share movement of eventful year 2008 of a primeval and leading company of textile industry of the country has been thoroughly analysed over astrological format. The results are conformed not only with SVB Chakra but also with epoch chart after suitably corroborating to the stated astral principles and axioms. Besides, radical chart of Bombay Stock Exchange has also been illustrated and analysed. In addition, the historical chart of BSE from 2008 to 2010 is displayed for validation on SVB Chakra. Trust, this enlarged edition will impart ingenious and creative material to the inspired readers. All the chapters are subject specific and are complete in itself. The broad sense of each uniquely scripted chapter is condensed in the preface and a quick perusal of which will give rich flavour of the book. The author was Executive Director (Retired) in the country’s one of the largest Public Sector Undertakings. He is Jyotish Visharad from ICAS, New Delhi. For the past two decades he is pursuing astrology as a hobby and sharing his experiences with the inquisitive aspirants who have reposed great confidence in this ‘Divine Science’. People are charmed by the business and financial astrologers for variety of reasons. The traditional business houses solicit the services of family astrologers who not only presage future of their family but also help concluding the deal of profit yielding transactions at the propitious moments. The traders of the present time also look forward to some incredible predictions doled out by the commercial astrologers from time to time and try to synthesize them with the behaviour of the stocks or commodity markets. They also corroborate these forecasts in fixing the market trends. 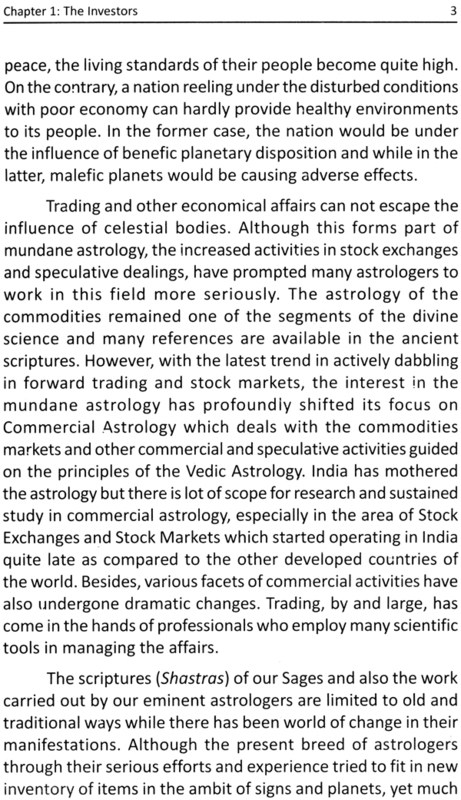 There never have been tenacious demand of such prophecies and also business fortunetellers are not much sought after but for the speculators and stock investors who repose an incontrovertible faith in astrology and reckon it as a prolific and discerning tool in charting the market trends. Commercial astrology also known as business astrology besides portending market tendencies and vacillation of prices of diverse commodities, also predicts the fortunes or desolation of business concerns. The reason for abhorrence of the different facets of astrology, especially the growth of the firm, is in two folds. Firstly, there is hardly any description available in the pristine scriptures and also in the contemporary writings and secondly, the sufficient and accurate astrological data about the company are never recorded. Where ever such information is available even in a crude form, the same is rarely passed on to heuristic researchers. It affronts great difficulties in analyzing the company’s futuristic pattern of growth. Vedic Astrology is traditional ‘Jyotish Shastra’ of India. The etymology of the words suggests ‘Jyoti’ as a ‘Divine light’ and ‘Tisha’ a science. It is a science of divine light. Similarly, ‘Astro’ connotes ‘Stars’ and suggests astrology as the science of the stars or heavenly bodies. 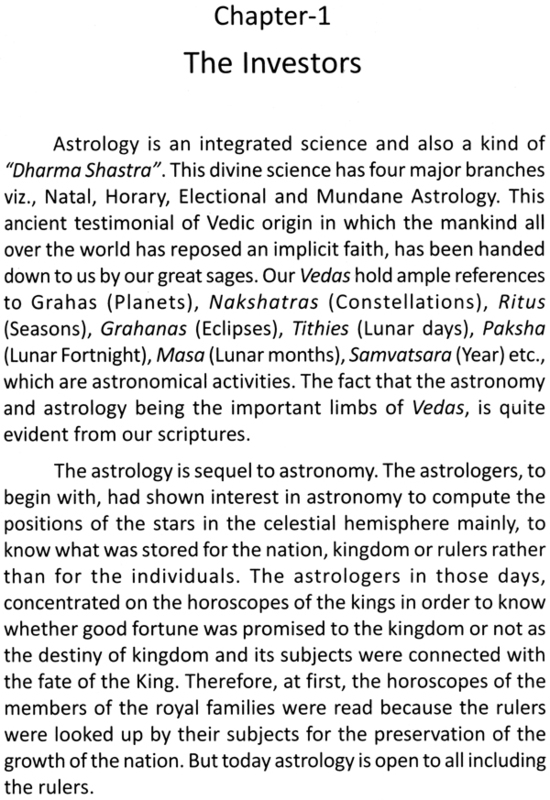 Infect, astrology Jyotish Shastra is one of the constituents of Dharma Shastra which synthesis all the fields of learning. ‘Astronomy, ‘Horoscopy’ and ‘Samhita’ are some of its components. The Jyotish was being practiced by our sages and seers from time immemorial. Our mythological teachings bear ample references on the celestial objects and corresponding terrestrial events. The term ‘Samhita’ means compilation which condenses many scriptures and works on a subject. 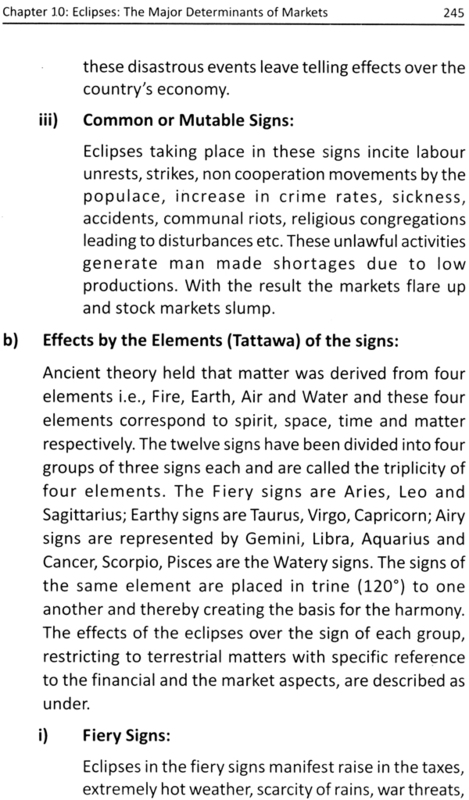 Samhita in astrological context is the garnering of all astrological treatises which influence or are connected with the human affairs. Mundane astrology bears many prolific features of human interests and Samhita therefore, amalgamates varied subjects of social learning. Birhat Samhita is one of such highly acclaimed testimony expounded by well known astrological savant Varaha Mihira. He gave this unique encyclopedic treatise which is revered even today. Varaha Mihira was the ardent follower of ancient sages but his approach had been quite scientific. His pronouncements on the inter-relation between solstice and Rahu-Ketu showed his scientific acumen. This theory of astronomical lore placed him amongst the galaxy of scholars in this field. His concept that the Sun forming the centre place and regulating the celestial forces of the universe shows his relentless efforts to draw out gross effects and establish influence of the Sun over the solar system. The word Mihira stands for Sun that helped shaping his pursuits. 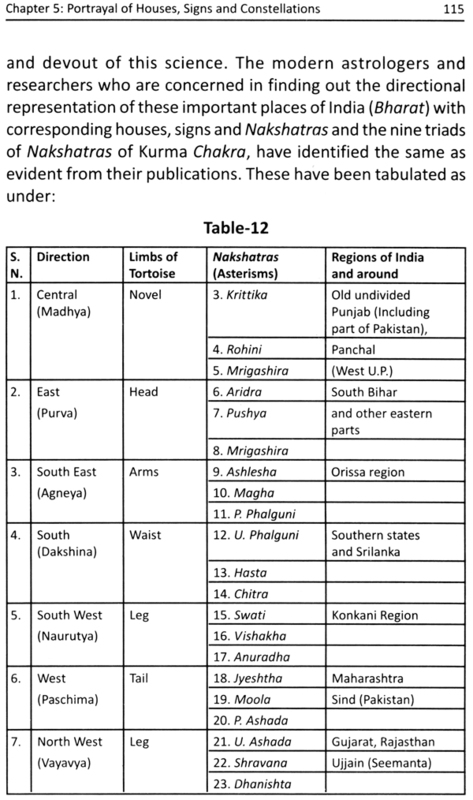 In Brihat Samhita, the countries are apportioned into nine regimes on the basis of Nakshatras and symbolically called Kurma Vibhaga (Division of Globe). Besides, people etc., are also classified and brought under the domain of stars and planets. These factors form the very basis of mundane astrology. It also speaks about planetary kingdom where years, months and days are presided over by different planets to elate the effects of mundane affairs corresponding to the signification of the concerned planet in a particular period. 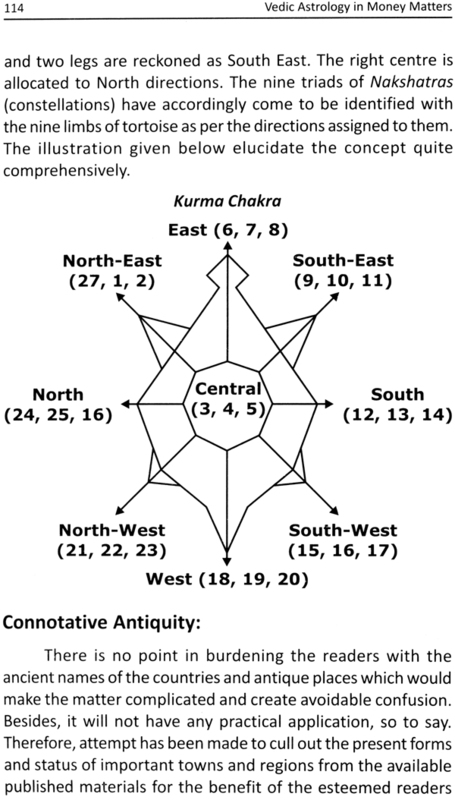 To Judge the importance of this regimentation, a detail description of Kurma Chakra has been given in chapter-5 but the information was limited to the requirements of the book. Besides, this chapter of Brihat Samhita has commercial lineages with the present time which holds great value in commercial astrology. 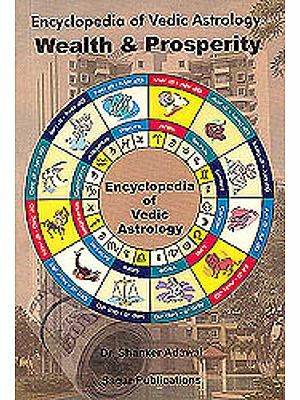 In this book an attempt has been made to include such materials which provide comprehensive yet cogent astrological information with a view to render meaningful support to the business persons and investors alike in making timely and prudent decisions to accentuate gains and also to avert losses. As per the astrological precept, unless material gains are promised in the natal chart of an individual, the prosperity is hard to come by. There always has been fervent desire of a person to live a comfortable and blissful life. However, affluence does play dominant part in providing exuberant life style for which the past karmas are much to say, though, it is ostensibly taken as a result of ones present efforts. Every one in ones own right expresses anxiety differently and is eager to know material prosperity and financial successes. We know that the wealth does not always manifest happiness but people run after it. Abundant richness is never be a source of mental solace and bliss but still many pursue money matters with full jest and zeal as they consider it most potential strength and impregnate power of the material world. This hallucination of thoughts often confuses the people to adjudge the real goal of life. However, there are specific celestial laws which bestow wealth and riches to the native. The horoscopes presage source and time of acquiring wealth. The cosmic rays emanating from the Sun denote status to be enjoyed by the native and the Moon generates the creativity for the person. The placement and interfacing between the luminaries in harmonious houses create most effective combinations of riches. Besides, configuration of heavenly objects relating to wealth in one’s chart translates unequivocal opulence effects. A rudimentary principle is that the houses above the horizon are of much greater significance as they portray the prosperity, provided the planets tenanting these houses do not mitigate their potencity. The wealth is attributed to 2nd and the 11th houses irrespective of Ascendant, while the 5th and the 9th houses signify speculation and fortune respectively. The permutation and combination between the lords of these houses insinuate the possible avenues for acquiring wealth and riches. The dignity and intrinsic qualities of the planets determine the mode of sourcing the wealth. The interpose of the lord of the 6th house with the consortium of the planets representing the wealth giving houses, procreates gains through share markets, lotteries and other speculatory pursuits. The influence of the lord of the 8th house bestows windfall gains and acquisition of wealth through inheritance. An adage of astrology on wealth epitomised in Jaktak Bharnam says that the planets posited and aspecting the 2nd house (Dhana Bhava) and the lord of the 2nd house symbolised as Dhana Karaka, when get influenced by each other while in transit it indicates the right time to realise wealth. If the planets involved in such contribution happened to be the fast moving ones, the conjunction during the transit is going to be rather frequent. The progressed Dasas of these planets are another tool to fix the point of acquisition of wealth. To adjudge the relevancy of Dhana yogas in the commercial astrology, a full chapter is devoted to it. This chapter blends the components of wealth yielding renderings, both in vedic and western astrology. 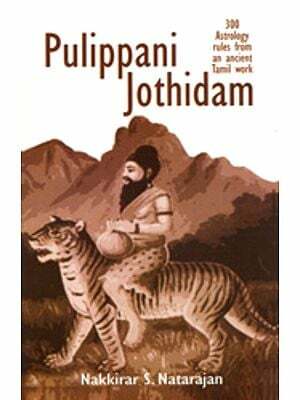 Dhana Yogas are drawn from the Vedic classical scriptures including Jamini Sutrams, so to say. In western astrology, wealth combinations based on Fortuna have been cited. This is followed by narrations of full set of classical yogas relating to riches with illustrations to prove the point that some strong combinations delivering successes do exist in the horoscopes of the affluent people. Electional astrology is yet another facet of astrology that plays effective role in shaping the success in a well begin venture. Therefore, a full chapter has been devoted in explaining the essentiality of this vital ingradient of commercial astrology. In chapter-4 it is explained that selection of right and opportune time is like seeking mandate in reaching out to favourable consequences. 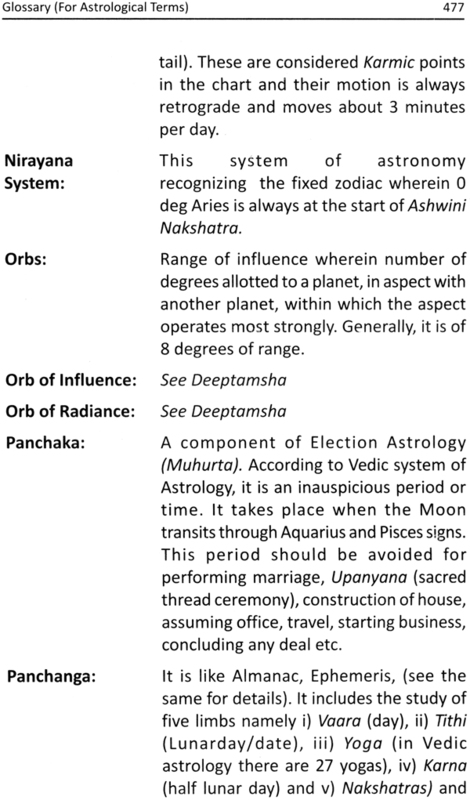 Although electional astrology is a subsidiary to horoscopy, it has distinct place of its own in astrology. In the modern time, a person yearns for the most propitious moments because a failure procreates more losses and pains in this competitive world. The reverses leave telling effects on a business but starting a venture at an auspicious moment is like harnessing the cosmic energies to ones advantage. There is no human activity on earth that does not beseech divine support. The Muhurta (Electional astrology) has assumed tremendous significance, more so in the present day’s life. The underlying idea of including a separate chapter on this subject is to give an insight to the readers over the fundamentals of electional astrology in a succinct form. Its necessity is felt primarily due to the fact that even a person armed with the expertise of the trade and full knowledge of market intelligence, may fail in a profit making deal but if one takes a plunge at a right Muhurta suitable for a particular work, it ordains great confidence, dispels apprehensions of uncertainty and passes on a smooth play in the endeavour. We all know that value of time is immeasurable. The celestial forces procreate every object in the nature at a particular moment, develop it for a certain length of period and dissipate it on an appointed time. To comprehend this phenomenon, it is essential to understand the heavenly currents that influence the continual activities. It is suffice to know that we are living in an environment of vibratory energies which regulate the cyclic functions of creating, developing and destroying. The radiations emanating from the celestial bodies though invisible, greatly affects the proceedings relating to life cycle. The Sun which unites energies, has the predominance over the solar system and thus is the prime force in governing the life process. The perpetual assimilations of this planetary energies by our ancient sages were subtle and accurate which formed the fundamentals of vedic astrology, especially in Muhurata because the elected time for a specific event is that when all the propitious vibrations are focussed onto it so that the energy produced at that moment counters all the inauspicious forces and guarantees success in the venture. The electional astrology though simple in its application, it serves most useful purpose. The knowledge of celestial’s concepts is exceedingly important to fix the favourable time for those who wish to celebrate a function or launch a new project etc. 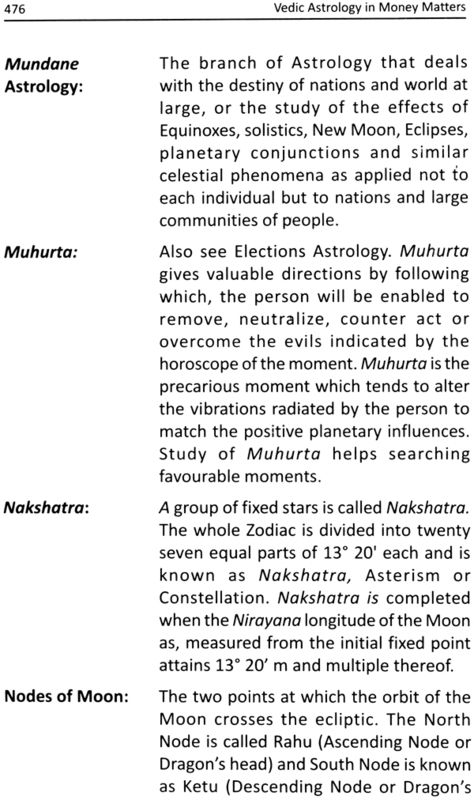 In fact, Nakshatras are the key factors in Muhurta. The chapter on the subject dealt in the book touches upon all the basic principles including classification of Nakshatras in a lucid manner. In chapter-4 on “Propitious Movements”, the auspicious time and elements of Panchangs (Almanac) conducive to commercial activities have been cited with protracted descriptions for an easy assimilation by the users. Terrestrial changes are the reflections of celestial occurrences. These modulations are more noticeable in the field of mundane matters, political and commercial activities of the nations. A mundane chart of the nation, political party, business concern or for a specific event is drawn to delineate the effects of the heavenly bodies perse. 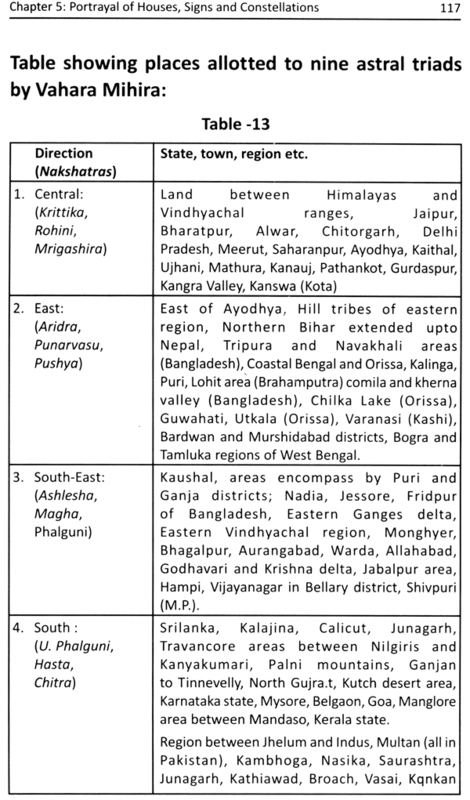 The houses of mundane map are co-terminus with twelve zodiacal signs and natal houses but signification of mundane houses have a wide range of application as all the worldly matters are catered for through these houses. 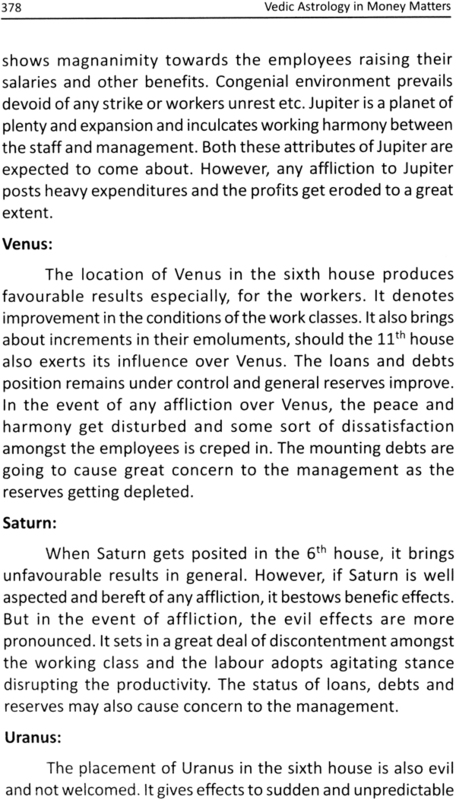 In chapter-5, the portrayals of houses signs and Nakshatras in context with mundane affairs have been described. 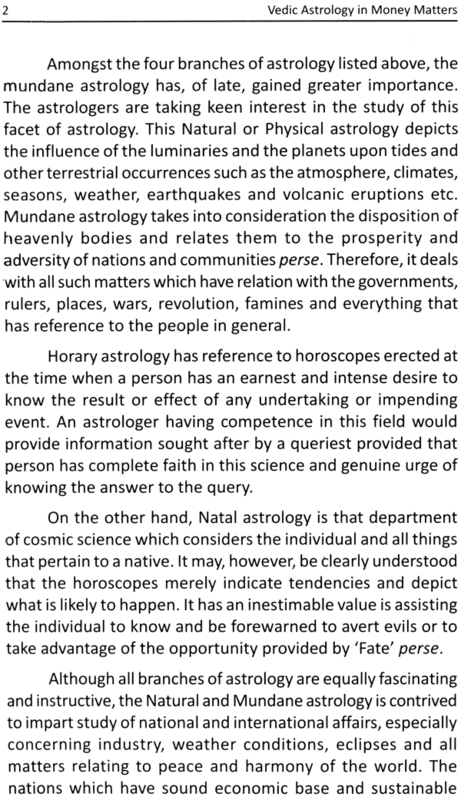 The fundamentals of these have deliberately been avoided to contain the volume of the book to a manageable level and also on the presumption that the readers are well versed with the basics of astrology. Similarly, the signification of planets are also confined to earthly effects with main emphasis on the commercial activities such as bullion, stock exchanges, markets and other business related matters. In this scheme of things, the trans-Saturian planets are also included as in mundane astrology Uranus, Neptune and Pluto have assumed greater importance. Being distant, slow moving and weighty planets, their effects last for a much longer duration. Besides, they are the integral part of the solar system and also seen playing dominant role in commercial activities apart from the terrestrial affairs. On the same analogy, both Vedic and western aspects are described. No doubt Vedic aspects are no less efficacious but since western aspects are reckoned within one degree; it produces much subtle and dainty results. Involvement of trans-Saturian planets and western aspects are inescapable rather an obligatory requirements in deciphering the potent effects. Long terms market fluctuations are traced through heavy outer planets while minor planets cause short term market trends. 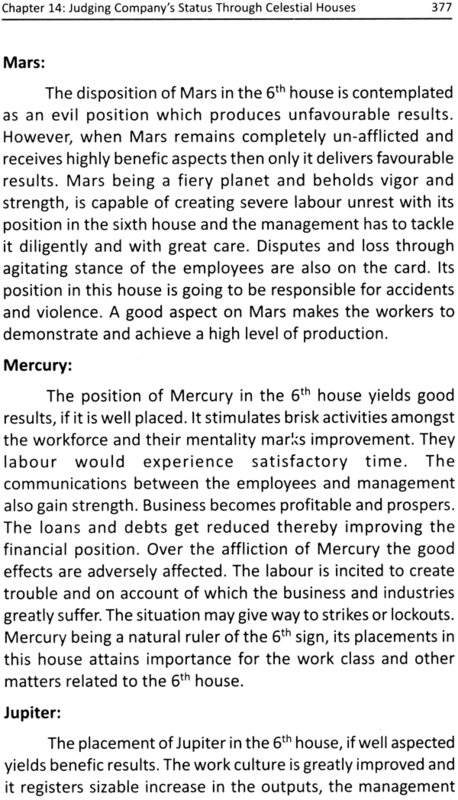 Mercury and Venus destabilise the markets more often but for a short span. These prodigious effects make the speculators and investors guessing. Navamasa is most valuable harmonic division of Vedic astrology. Navamasa plays exceptionally important role in outlining the results. The dignity and strength of a planet get altered due to its corresponding position in the Navamasa chart. 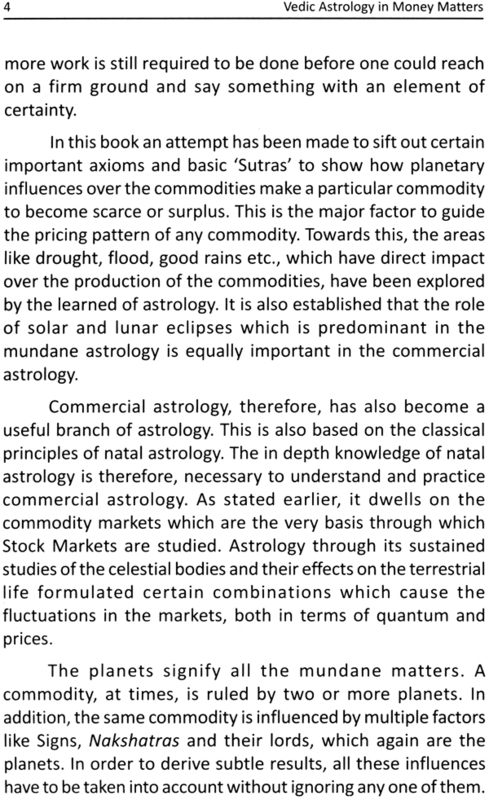 Just as the status of a planet in Navamasa supports the prediction in a natal astrology, it also brings forth startling effects in commercial astrology. The market trends from the position of Navamasa of each planet have been described with specific reference to stock share, bullion and other markets of the leading items. In mundane astrology, eclipses have substantial contributions in pronogisticating the events of grave nature. 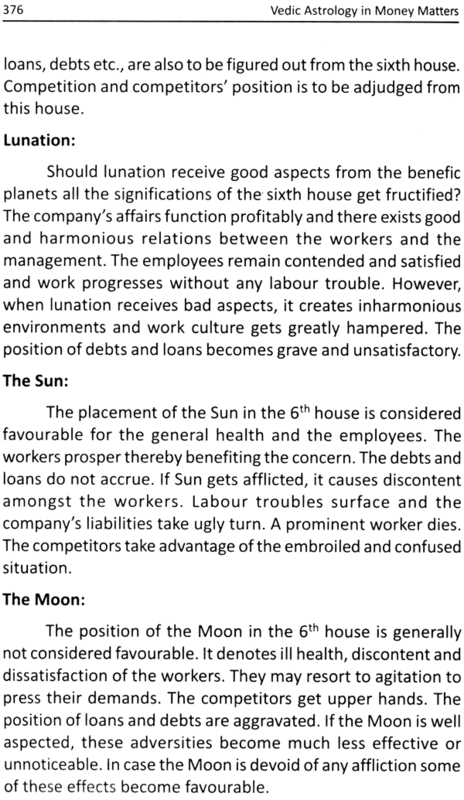 The Sun and the Moon are also the determinants in causing the eclipses. These luminaries also regulate the market’s functions which are greatly influenced by these eclipses. 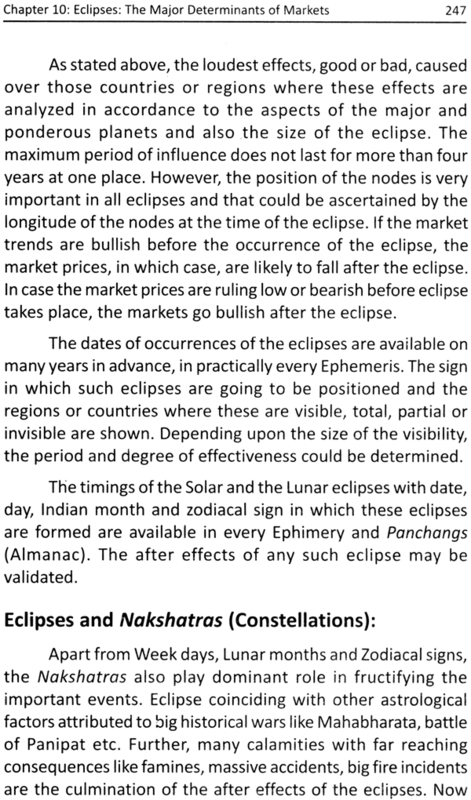 The effects of eclipses, at times, are surfaced after many months and persist for years and that is why it is more significant from the point of view of the market trends. The occurrences of eclipses coupled with configuration of major planets, impel far reaching consequences. There was a total lunar eclipse on the lst/2nd night of September 1997 and was visible in Asia including all parts of India. During the whole year 1997, major planets like Jupiter, Uranus and Neptune remained in Capricorn sign. At this juncture, severe drops were registered in the indices of the major stock exchanges of the leading nations of South-East Asia, including Japan, Hong Kong, Singapore etc. India was no exception. The currencies of all these countries plummeted as compared to American dollar. 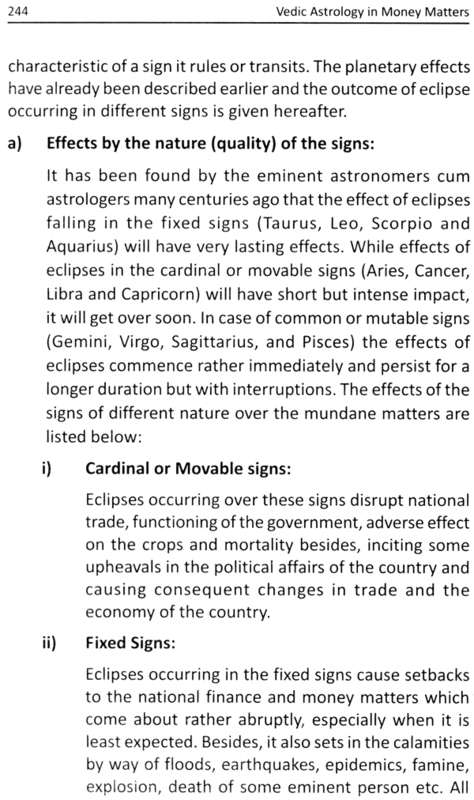 Therefore, groupings or movements of outer planets and corresponding eclipses are to be closely watched as these are generally found to coincide with the important events in the countries associated with such signs. The monthly market trends are based on the solar ingress as the Sun regulates the solar month. Besides, the Sun’s entry into the first degree of Aries sign every year is very significant because it holds clue to what all is going to eventuate or turn out to be during the impending year and in what propensity? The position of planets at the time of solar ingress, impart critical role in predicting the year long activities. 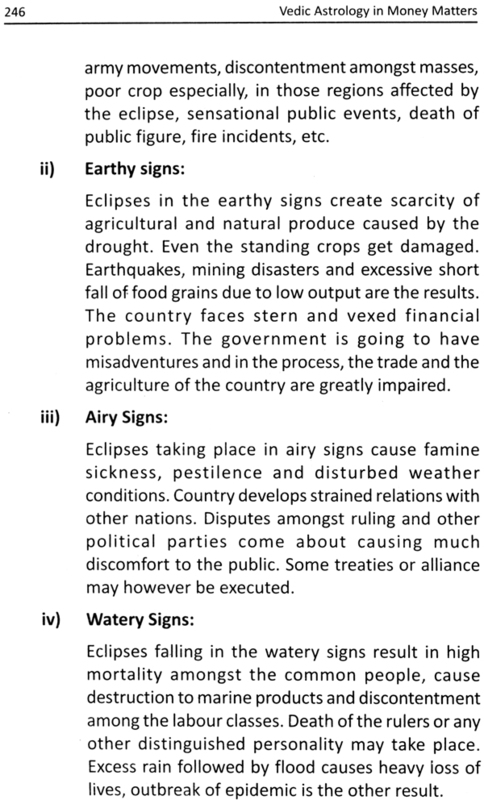 In chapter-11, the effects of various rising signs at the time of solar ingress over the markets of several commodities have been succinctly described. This was followed by explaining the results of Sun’s entry in different zodiacal signs by observing the relationship between solar ingress and market trends of many commodities. This chapter is concluded with some snippets of widely acclaimed ancient expositions on the subjects for the benefit of the readers. The application of Sarvatobhadra chakra in delineating the price fluctuations has been found quite effective. In this Chakra, the Nakshatras hold the fixed and yet key position while the transits of planets through these Nakshatras presage the behaviour of various markets and chart out the pricing trends of the commodities denoted by the planets and Nakshatras causing vedhas, signs, Nakshatras and planets suffering vedhas. It is important to note that the planets and signs involved in vedhas should essentially be engaged in aspects during the transit because in the absence of which a vedha ends up in frivolity. On the face of it, the Sarvatobhadra Chakra looks plain and simple but in practice, it is not so as delineation through it depends upon many complicated factors, such as speed and motion of the planets which springs sudden shifts in vedha from one direction to another direction that may either fritter away the effects all together or get reversed. This composition is however, devised a compact yet versatile system which unfolds complete market behaviour through planetary transit. Besides, it also provides significant clues to other mundane affairs. 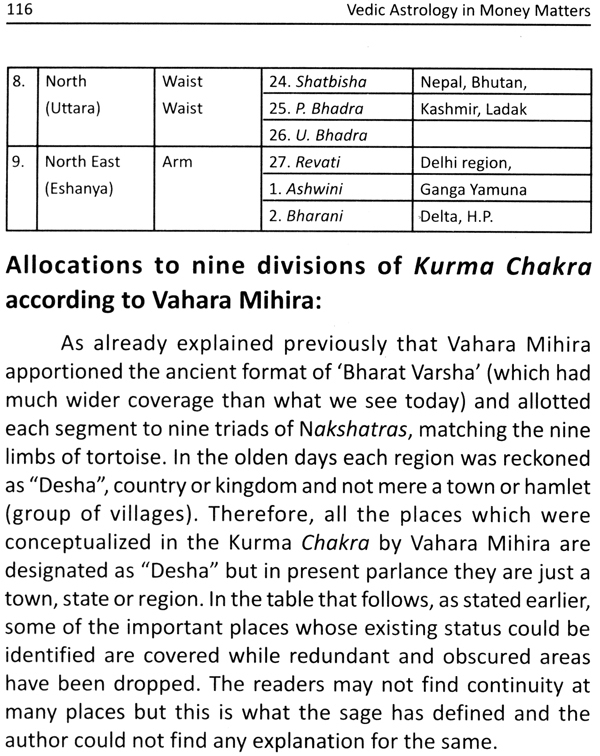 A great deal of efforts have gone into it in gathering, collating and experimenting multitudinal details to bring forth a well crafted chapter-12 on Sarvatobhadra Chakra which hopefully, the reader will find quite informative and useful. In 1997, the gold and silver markets moved in opposite directions inasmuch as there were series of slumps in gold prices while silver showed buoyancy. The movements of planets at that point of time were interposed over Sarvatobhadra Chakra and its principles have been validated in this chapter. The efficacy of this chakra has also been demonstrated in tracing the peaks and bottoms of BSE Sensex indices during the same year. Owing to constraint of space and other compulsions, the application of chakra has to be limited only to this aspect. However, the information and clues enunciated in this chapter are open for the reader to try out and see for themselves the astounding results through this system. The heavenly bodies travel at different speeds and motions except the Sun, the Moon and soli-lunar nodes. These movements are controlled and regulated by the Sun who governs the entire solar system. The planetary course in the universe is traced through the projections as observed from the Earth. Since Earth rotates on its own orbit, the planets appear to be receding due to relative motion. 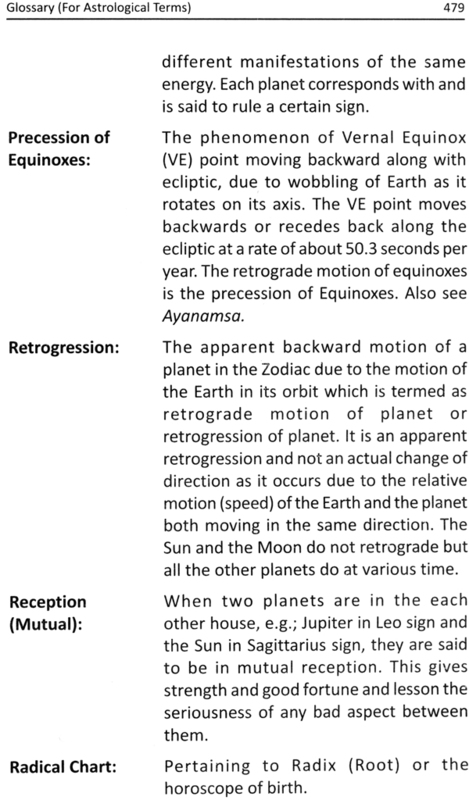 This is the state of apparant retrograde motion of planet. In switching over from direct to retrograde motion and vice versa, a planet acquires different speeds spaning from acceleration to stationary. These varigated motions and speeds cause perceptible impact over the worldly affairs. This theory with specific emphasis on the commercial activities has been dealt at length in chapter-13. 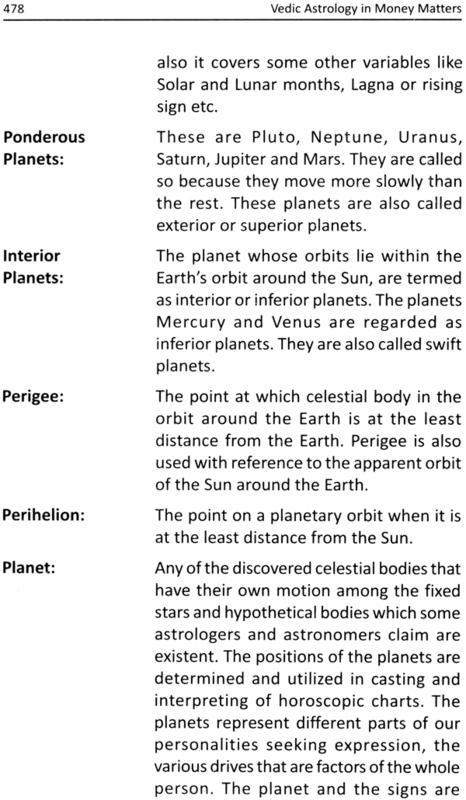 This chapter also carries a comprehensive description on the concept of heliacal settings and risings of planets which relate to their disappearance and reappearance in the vicinity of the Sun whereby planets lose their strength. Obviously, their impact either bullish or bearish over the markets gets dissipated at these points of time. Close observance of the movements and states of planets, provides answers to many baffling market situations. The business astrology is also related to the study of the prospects of a business concern presaged from the horoscope drawn on the date and time of incorporation of a particular enterprise. This segment of astrology has not been popular, like the other disciplines, which is primarily due to the fact that accurate data of the formation of the company is generally not available. Besides, the time tested principles and expositions on this aspect are hardly found in the ancient texts because this form of astrology was not pursued at that time. However, when scope of mundane astrology was enlarged with the rapid development of commercial activities with inherent risk, a few scholars devoted some time to study astro-effects on the houses attributed to business activities. The approach is not well directed and progress is rather tardy. Hence awareness on the subject has not gained much momentum due to the lack of scriptural support. Nevertheless, the general approach is that when a company is incorporated and assumes a separate entity, a heavenly figure of that epoch is drawn which is taken as company’s chart like a natal horoscope. If a company commences a new venture or undertakes expansion, the chart of that moment is erected to assess the prospects of such ventures. In the absence of the basic details, 12-00 noon time, when the Sun is at zenith is taken as time of formation of the company on that particular date. The chart also helps predicting results from the Moon sign and in Vedic astrology it is reckoned as equal to ascendant. The corporation’s chart depicts the on going operations but subtle results are hard to delineate with accuracy. In chapter-14, the significations of houses relating to various corporate activities have been described on a much larger format to cover all the perceptible manifestations in the businesses. The effects of lunation occurring on different houses of the horoscope have also been corroborated to adjudge the monthly business trends. As mentioned above, the 1997 was an eventful year and one of the astrological reasons was the association of three major planets who remained in Capricorn sign through Out the year. Incidentally, India falls in the ambit of this sign. There was Jupiter, Neptune conjunction on the 9th January’97 which was followed by Jupiter-Uranus conjunction occurring on the 16th February 97. While Jupiter is planet of expansion and growth, Uranus springs suddenness and brings abrupt changes and wild fluctuations in the market prices due to its evil nature. 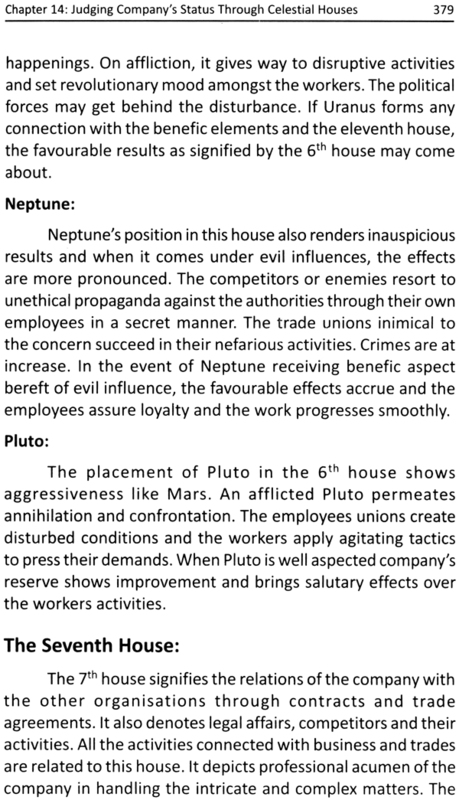 Neptune is a planet of chaos and dissolution. The proximity and then forming conjunction of these plants set the tone and tenor of the markets. Total instability and uncertainty prevailed. The graph of stock market i.e., BSE Sensex index first climbed in January’ 97 followed by a decline and then again rose to touch 4568 point on the 6th August 97. This height just fell little short of the September’ 94 mark at 4646. Thereafter, a slump was witnessed and Sensex index plunged to 3320 point on the 11th December 97. Similarly, gold prices by and large remained subdued and at one stage of the year, it ruled 12 year low which was a phenomenon and kept the speculators and investors at tenter-hook all through. On the other side, the silver markets showed buoyancy and it crossed Rs 8000- per kg in that year. However, it also touched dicey low values creating flutters for the traders and consumers alike. The unusual behaviour of these markets including gold has illustratively been dealt in the last chapter-15, titled “The Precept and a few Notable Events”. The planetary conjunctions and aspects formed during the said period have fully supported the market trends. The same effects are also validated through Sarvatobhadra Chakra and it was established that the market fluctuations irrespective of bullion and stock share were in consonance with the cosmic laws and astrological precepts. In fine, it is true to say that in astrology, each business and activity of a trade house can be graphed as every trade do have time of birth i.e., when it was initiated. It is equally possible to ascertain whether a venture will succeed or otherwise by knowing when it has commenced. If the beginning is made on a propitious time and the promoter holds promise in his horoscope, the chances of success are exceedingly high. This book is not meant to be a treatise or an encyclopaedia. It is just a guide and if the esteemed readers find at places, inadequate treatment, absence of details or any omissions/ errors, the author may be excused. I acknowledge my indebtedness to all the authors whose works I referred to as a source of information while writing this book. I am aware of my formal thanks to my learned friend and guide, who much against my wish, desired to remain anonymous, for generously giving me his valued opinions, critical reactions and constructive tips, from time to time. He very kindly went through the proofs despite his busy schedule and brought about some useful modifications. But for him, this book may not have been true to its contents. I highly appreciate his magnanimous gesture. I also place on record the co-operation extended to me by my beloved wife Urmila, who also gave whole hearted support and encouragement inspite of the fact it caused much inconvenience to her daily household chores. I also offer my gratitude to my revered sister who blessed me so warmly for my success in this pursuit. I am highly appreciative of the efforts made by Mr. Narinder Sagar, and his son Saurabh Sagar of Sagar Publications, in collecting host of materials and data which immensly helped shaping the book in the present form. Besides, their continous encouragements and relentless support made it possible to present the book before the readers in time. Their genuine passion in promoting Vedic astrology in India and abroad is incredible. The author hopes that the style and contents of this work will be easy, enjoyable and stimulating and would encourage the readers to take on to practice the postulations and rules of the commercial astrology enunciated in this book to the best of their advantage. I sincerely wish them all success. I am happy to present herewith the second edition of my book. The reality that new edition has been called for, bears testimony to the fact that the readers have evinced keen interest in the subject matter of this unique publication. The format of the book though exotic in character, has a great deal of utility in handling the contemporary aspect of astrology. During this period, I received candid views and also some profound reactions from my esteemed readers. One set of readers who perhaps had insufficient exposure to astrology but were deeply involved in the commercial activities, urged to know explicit manifestations of astrological terms, in particular. Yet, other who though were well versed in astrology, possessed less intimate knowledge of commercial field, needed intricate explanations of the business terms referred to in the book. To meet the fervent desire of dear readers, Glossary of both astrological and commercial terms has been annexed to this edition in a fond hope that it would come handy and make reading a pleasurable experience. It may also provide great value to those who are in search of true astro-economic knowledge. At the outset I would like to convey my sincere thanks to my esteemed readers for having shown immense interest in this book. The book went out of print for quite sometime. The popularity of the book could be judged from the fact that my publisher is getting huge amount of requests from the serious readers for making early availability of this book. Having been encouraged with this fervent response, I took upon myself to go into further research on Sarvatobhadra Chakra by taking queue from the highly vacillation and drastic swing the stock markets have endured in the recent years. Previously, in chapter 15 the Stocks and Bullion markets graphs for the year 1997 were analyzed in a great detail. It is now thought expedient to examine the behaviour of stocks of some leading and prominent company both on epoch graph and SVB Chakra. In pursuant to this goal, chapter-16 has been added to this book in which the movement of stocks of a leading company has been scrutinized both through horoscope drawn at the time of its formation and SVB Chakra. The stock chart of the year 2008 of this eminent company has been probed comprehensively and corroborated with the principles and other astrological axioms brought about in this book. In this period the share of the company touched both apex and bottom most points in the same year. This amazing swing in the sensex graph infact impelled me to substantiate this sway astrologically by employing Sarvatobhadra Chakra and normal epoch graph. The years 2008 to 2010 were also quite eventful years when the stock market of BSE sensex crossed 20k mark twice and also hit bottom at the level of 8k and remained in this state for quite sometime. The bottom point arrived at the end of 2009 and continued till the beginning of 2010 where it came down to near 8000 mark. The radical chart of BSE is also drawn and strength of this graph has been analyzed. The scrutiny is left at this point in order to afford opportunity to the readers to further study the movement of the sensex of BSE in the manner company’s horoscope was examined. The results can also be validated through Sarvatobhadra Chakra on the line the 1997 stock market of BSE was studied in chapter 15. In addition, the text of the book has also been edited and some portions are abridged or removed while some corrections are instituted to bring more clarity and cohesiveness in the concept. The author is confident that this enlarged and revised edition will impart valuable information to the valued readers who will be tempted to examine many more such cases to establish the veracity of these tools.